If you want to know what the partition table is, you should learn the physical structure of the hard disk first. The above picture is the physical structure of a hard disk; the hard disk consists of several discs. How to locate a position on a hard disk? There are three words you should learn: cylinder, head and sector. 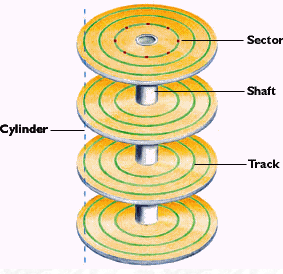 The disc that makes up the hard disk is divided into tracks; tracks of all discs which have same track value are called a cylinder, so the cylinder is a pile of tracks with same track value of a hard disk. Normally, a disc has two heads for reading or writing data, one is for the top and the other one is for the opposite side; the head value means the disc location and side. A track is composed of sectors and the number of sectors of all tracks on the hard disk is the same.Sector is the minimal storage unit of a hard disk; the size of one sector is always 512 bytes (rarely, it might be 1024, 2048 or 4096 bytes in some special hard disks). How to locate a position on a hard disk? Since the sector is the minimal storage unit of the hard disk, so the above question becomes how to locate a sector on a hard drive. You are wrong if you indicate a disc first; you should indicate a cylinder first and then indicate the head. The head will determine the disc position and side after which you can locate the sector you want. Since we have gotten a glimpse of the physical structure of the hard disk, in the next article we'll learn something about partition table. 1.Start PartitionGuru and on the Partition and Folder Tree of the main interface select the hard disk. 2.On the right part of the main interface, you can see cylinder, head and sector value. 3.Besides, you can see the total sector number of the hard disk and the size of one sector.